Old art is generally a less profitable segment of the art market than Contemporary art primarily because the latter segment enjoys the price impact of fashion, speculation and frequent turnover whereas old masterpieces are rare, relatively stable in price and sold much less frequently. 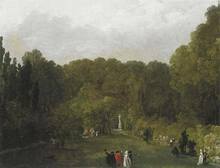 Updated on 25 Apr 2019: Hubert ROBERT (1733-1808) (France) is an artist born in 1733 The oldest auction result ever registered on the website for an artwork by this artist is a painting sold in 1984, at Christie's , and the most recent auction result is a painting sold in 2019. Artprice.com's price levels for this artist are based on 1,483 auction results. Especially: painting, print-multiple, drawing-watercolor, miniature. 4 art works by artist Hubert ROBERT (1733-1808) will soon be available in auction rooms. You can also discover 1 artwork(s) currently for sale on Artprice's Marketplace. , sold by 1 Artprice store(s).